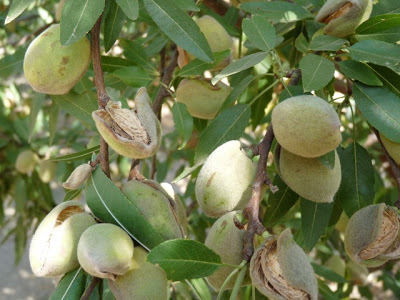 California's 2013 almond production is forecast at 1.85 billion meat pounds, down 7.5 percent from May's subjective forecast and two percent below last year's crop. The forecast is based on 810 thousand bearing acres. Production for the Nonpareil variety is forecast at 650 million meat pounds, four percent below last year’s deliveries. The Nonpareil variety represents 35 percent of California’s total almond production. After a very cold winter, the 2013 almond crop began bloom two weeks later than normal. Bloom was strong and fast, which shortened overlap and pollination time. High winds in early April knocked nuts and branches off trees, as well as knocking down some trees. Nonpareil drop was reportedly heavy. Despite the late bloom, harvest is expected to start earlier than normal this year. Mite pressure has been high this year. Water has been a concern for growers in the San Joaquin Valley this year, as rainfall was very low and allotments have been reduced. The average nut set per tree is 6,686, down five percent from 2012. The Nonpareil average nut set of 6,141 is down 7 percent from last year’s set. The average kernel weight for all varieties sampled was 1.36 grams, which is the lowest average kernel weight in 40 years. The Nonpareil average kernel weight was 1.48, the lowest average kernel weight for Nonpareils. A total of 98.9 percent of all nuts sized were sound.